Late in July 2004, a mini-dustup occurred when Teresa Heinz Kerry—the wife of Democratic Presidential nominee John Kerry—told a reporter “Now shove it!” I wrote about it for a column in Newsday (below). Today, looking at this through the filter of our current President, who is pilloried for sparring with journalists, it is striking that Mrs. Kerry wasn’t only forgiven for attacking a journalist, she was actually cheered on by journalists. It wasn’t a big deal, I didn’t hate her for it, and I didn’t view her unfiltered style as a threat to democracy. 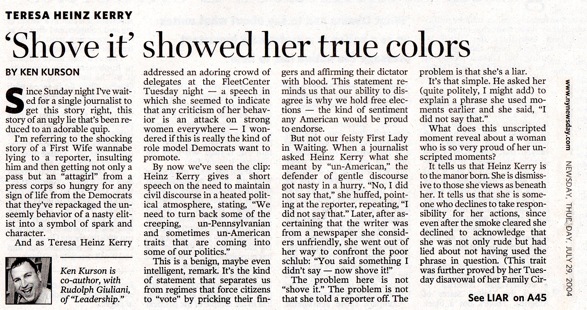 But it was a lie, and it was delivered with kind of menacing language, so it was strange to see many journalists, in their hunger for a tighter race and signs of a pulse from a wooden Democratic nominee as much as any political bias, celebrate the would-be First Lady’s “toughness.” Back in 2004, yelling at journalists and accusing them of fake news was not quite the threat to civilization that it would become in 2016. Interestingly, although my column itself doesn’t seem to have made it into Newsday’s CMS, there were a ton of letters opposing my column—two days worth—and some of those did make it onto the site.